On the table in under 30 minutes, this delicious and healthy pork Yuk Sung family friendly recipe is so easy to make, it is the perfect mid week supper. 1 tsp Ginger Puree or 1 inch piece if using fresh. Peel and finely chop carrots. Peel and chop Ginger (if using fresh). Heat half the oil in large open wok, fry the pork mince until browned. Then remove from pan and stand to the side. Add the rest of the oil to the pan and fry onion, garlic and ginger for around three minutes until soft. Add mushrooms and carrots, fry for a further five minutes. Put pork back in the frying pan, add in five spice, dark and light soy and oyster sauces. Cook on a medium to low heat for 10-15 minutes, until the mixture is browned, sauce has thicken slightly and absorbed into the meat. 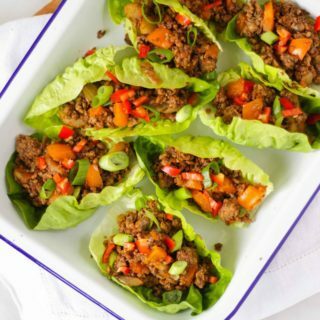 Serve in little gem lettuce leaves, and top with chopped spring onions and chillies. (Leave chillies out if you prefer).